If you’re looking for a new pair of women’s dress boots, then you’ve come to the right place. We’ve done our research, and have some nice products which should hopefully inspire you. Dress shoes can often be quite difficult to shop for with so many options on the market, and many different styles to choose from. Boots, on the other hand, are usually seen as more of a casual shoe rather than formal, and this is where some women might struggle to find a formal looking pair of boots that are both fit for the office, or for that special occasion. That’s where we can help you out! We have sourced five pairs of the best women’s dress boots available, to help you try and find the perfect pair. Whether you prefer a thick or thin heel, lace up or zip up, you should be able to find a suitable boot in this article. We hope this article will help give you the right amount of inspiration to purchase a new pair of dress boots soon. As we are focusing on dress boots in this article, we thought we should begin by tackling a common question which is sometimes debated, and that is are boots formal wear? Many people believe that boots should not be seen anywhere in a formal event, or even at the office, whereas others think that this is completely wrong! This is because boots have been glamorized in the media, and even in films and music, where rockers and girl bands have famously worn them, to the point of seeing them in the office would just seem strange. However, nowadays, the design of boots has become a lot more versatile, and it is definitely starting to change. It is possible to find shorter boots which resemble smart shoes, and which don’t even include a heel. There are styles available for both men and women, and more and more of us are starting to jump on the dress boot trend, styling them with various different outfits. Therefore, although most people tend to think boots are only casual wear, we really think that boots can be casual as well as formal, as there are so many more modern styles appearing on the market. One of those styles is, of course, the ‘dress boot’ and that is what we’ll discuss next. If you think of a really smart shoe, that is laced up and made of leather, and add a small shaft to cover the ankle, what do you get? A dress boot. A dress boot is basically a smart boot which is capable of being worn in formal situations and environments. Let’s be honest, you wouldn’t walk into the office with a pair of Abba style boots unless of course, it was a 1970s dress-up theme. Dress boots are boots that are made to look trendy, yet keep a smart look at the same time. This means they are safe to wear to work without the wearer being judged as having casual wear, or a ‘party look’. For women, dress boots will often feature a heel that will not be higher than around 3” in order to remain comfortable, and easy to walk around in without exaggerating. For men, there can also be a small heel on the boot; just small enough to give a bit of height, again without exaggeration. Boots have been worn throughout history and were often preferred over shoes. Therefore, it only makes sense that they can also be worn in formal events today without any concern. Looking at things from a more practical point, boots actually take better care of your lower legs and feet than a simple pair of shoes do. Why? Because they’re designed with more protection from bad weather, water, and other elements. Dress boots are usually a lot more durable and can be warmer during cold weather. Height is another area where dress boots can come in handy. Some people feel more confident when they have a little extra height, and this can really help them, for example in social situations, as well as at work. Dress boots can be a real confidence booster as they usually feature a nice sized heel which isn’t too high, providing just the right amount of height. Both men and women can enjoy some extra height in their dress shoes, and will definitely reap the benefits. Comfort is another factor that influences many people to wear dress boots. Sometimes shoes can feel too open or too tight. Slipping on a pair of dress boots might actually feel like the more comfortable option and whenever you want a cozier, carefree day, these boots can be a complete life saver. As there are so many different varieties of dress boots on the market, you can quickly and easily change up your style. Certain boots may compliment an outfit better, such as when paired with smart leggings or tights with a skirt. It can also be fun to change up and swap styles every few days, especially at the office. Now, with that being said, we believe it’s time to take a look at five different pairs of dress boots which are popular sellers right now. The first pair of dress boots featured on our list is the women’s knee lace-up boots by Top Moda. These boots are very stylish and come in nine different colors. We take a look at these boots in more detail below. Top Moda is a California based company that specializes in fashion shoes, heels, flats, wedges, sandals, and boots. They have a super reputation and their women’s knee lace-up high heel boots are very popular. Their boots are also stylish and guaranteed to look good with any outfit. When purchasing new dress boots, you will want a pair that is both smart yet fashionable at the same time. Luckily, the Top Moda boots are just that. Thanks to their synthetic design, they are made to look good, and their lace-up design is simply fabulous. Many Women find that when purchasing dress boots, it can be quite hard to find a pair that will fit around their calves. Top Moda have thought about this in advance and created a great fitting boot which is perfect for those ladies with wider calves. These provide a flattering fit, and are suitable for both day and night wear, making them great for a range of different occasions. Do you like to own boots in a few different colors to mix it up now and then? Well, Top Moda offers nine different options with their knee-high boots! This ranges from taupe, premier black, black, premium black, premier white, white, grey, tan and finally premier tan. These colors are really beautiful and give you more opportunities to find a pair to suit your individual taste. Looking for a pair of boots to match your favorite outfits? Well, these lace-up boots are perfect with a pair of formal trousers or skirt. Similarly, they can also be worn casual with jeans, leggings, and dresses. You will never run out of ideas with these boots and always have a new style to take to your workplace. 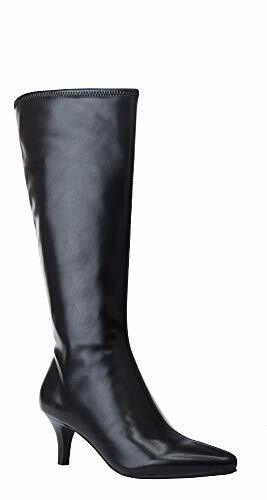 The next pair of dress boots on our list are the women’s knee-high dress boots by RF Room of Fashion. These feature a beautiful leather style, as well as animal-friendly design! We take a look at their key features below. Room of Fashion is an international internet-based fashion store which designs the latest trends in footwear while offering the most competitive pricing possible. Their knee-high dress boots are very stylish and definitely a trending style at the moment. These boots are bold and designed to go with almost any outfit you can think of! More often than not, Women decide to avoid wearing heeled boots altogether as they can sometimes be uncomfortable to walk in on a daily basis. These boots, however, come with cushioned insoles to increase the amount of comfort. As well as this, the 3” block heel was designed to be easier on the heel of the foot by offering a larger circumference, which better supports the entire foot. This results in an easy to wear dress boot which can be worn all day long! Many dress boots on the market are often designed using animal skin, and for those who are against this, it can be a big problem when looking for boots. Luckily, these boots by RF Fashion are animal conscious, and therefore have been lovingly designed with 100% vegan materials, making them a perfect option for all animal lovers out there! 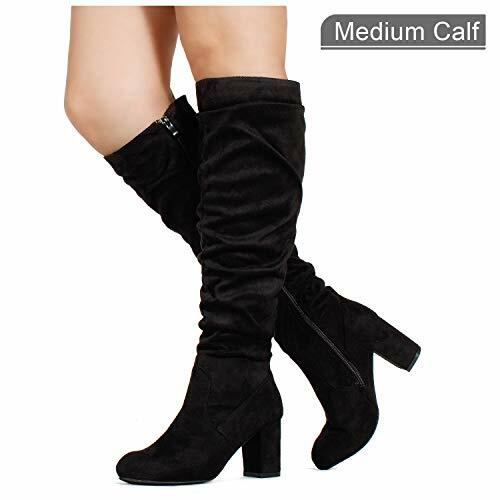 The great feature about these knee-high boots is that they come in a variety of calf sizes. This includes slim calf, medium calf, and wide calf, meaning there will be a pair to perfectly adapt to every women’s leg shape. Another unique point these boots offer is their hidden pocket. Have you ever had a secret pocket in your boots before? Well now might be your chance! These boots have a convenient hidden pocket which is spacious enough to place your smartphone, cash or cards, giving you an extra safe place to store your belongings. The third pair of best women’s dress boots on our list is the Indy dress boots by RAMPAGE. These are also made with Vegan-friendly material and are extremely trendy! We take a look at these stylish boots in further detail below. Are you looking for a pair of tall, over the knee boots? Then Rampage has the perfect pair for you! Their 14.5” tall boots are stunning and designed with zero animal materials, making them an environmentally friendly boot, which packs some serious style! If you are a fan of leather style boots, but seriously against cruelty to animals, then these boots are ideal. This is because Rampage has created their Indy boots with 100% Vegan materials, and which provides almost the exact texture to real leather, but without doing any harm to animals. These boots feature a classy look and will be perfect for vegans, as well as those who love animal-free products. The best thing about the Indy dress boots is that they are extremely comfortable. Thanks to a 2.5” pointed heel, they are not too high, meaning there is no chance of tipping over making them perfect for everyday wear. The elastic cut at the top of the boots make for an easier fit and flexibility while walking. These boots also feature an inside zip which makes them easy to get on and off. The fourth pair of Women’s dress boots on our list are the Noland Stretch Dress boots by Impo. These trendy boots come in a variety of color options and are perfect for any occasion. We take a look at the stretch dress boots in more detail below. Impo International are experts in all types of footwear and have been designing and producing shoes since way back in 1969. Therefore, you can expect good quality with their Noland Stretch Dress Boots! Most knee-high boots can be a little wide sometimes, especially for those with thinner legs, and so finding the perfect fit can be a struggle. If you are looking for a dress boot which is tight fitting, then you are sure to like these! Thanks to the slim calf, they look great matched with a pair of jeans or leggings, and can easily be worn casually or dressed up! These trendy boots come in 11 different colors, including; black, black kiddo, smokey taupe, pewter, midnight blue, vino, scarlet red, white, earth, earth suedey and natural. This, therefore, gives you the option to choose a few pairs to mix and match with your favorite outfits. Having boots which are comfortable is crucial! The Impo dress boots have been designed with a stretchy fabric which allows for a comfier fit. The non-slip outsoles also safeguard any chances of slipping on uneven or icy ground, giving the wearer complete peace of mind! A heel size of 2.25” also makes for easy walking and less pain on the heel. You will definitely receive a few compliments when wearing these boots! The soft suede boots are very trendy, and the leather style boots have been created with vegan material, meaning no animals were harmed in the process. This means they are well suited to vegans, as well as those who are totally against animals being used for their skins. The final pair of dress boots featured on our list is the women’s event heeled dress boots by London Fog. These are very chic boots which are perfect for any special event you may have in mind, as well as everyday wear. We take a look at these boots in more detail below. London Fog is a very well-known US Fashion brand, who have been creating outerwear for over 90 years. A metropolitan vibe can be seen in all of their products, and their heeled dress boots are no exception! When wearing heeled boots, you will definitely want to make sure they are going to be comfortable throughout the day, as too often, heels can start to cause pain – even in boots. Luckily, these boots feature a wide toe design, giving a good amount of space for the feet to spread without being too compact. The heel is also not too high itself, coming in at 4 ¾ inches, meaning it’s definitely not too high a heel for everyday use. Just like some of the previous boots on our list, this pair also features a vegan-friendly design with their vegan leather style. This means they are completely free of any animal products in their manufacturing, so they are perfect for all animal lovers out there. Nowadays, the taller the boot, the more in fashion it is, and these heeled boots by London Fog have definitely got the memo. With a boot shaft height of 14.5 inches, these boots just reach the knee cap and are therefore the perfect height for office wear as well as any other special event. You will be pleased to know that these boots also come in four different colors: two shades of black, grey and brown. This gives you a nice choice to choose from, and the chance to better match with your chosen outfit. Thanks to their metropolitan style, these dress boots can easily match with a nice pair of trousers, leggings, jeans, and even skirts and dresses! You will definitely enjoy wearing these boots to your event as they are dressy and trendy at the same time. 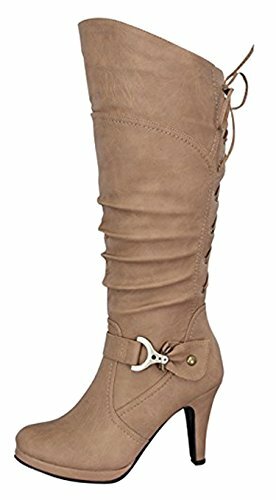 Which are the best Women’s Dress Boots for me? To conclude, we believe that all five pairs of dress boots featured in this article are bound to be great to wear, be it at work, special events or even nights on the town! If you are shopping on a budget and therefore looking to purchase a pair of boots without breaking the bank, the good news is that all of the boots we have mentioned are fairly inexpensive and great quality for their price! Perhaps you are keen to find out which pair is the most inexpensive? Then the Women’s Knee Lace-up High Heel boots by Top Moda are the ones you should probably take a look at. So there you have it. A few ideas of new potential dress boots which you can enjoy browsing, and hopefully purchase for yourself. We hope this article has given you some inspiration for dress boots and their benefits, and that you will find a new, trendy pair to match your favorite outfits soon.